After 4 weeks of public voting, the decision is in! 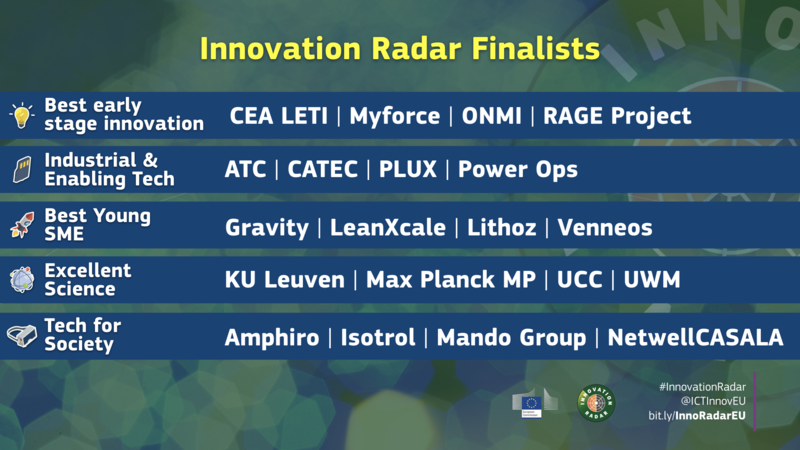 48 dynamic European innovators were longlisted for this year's Innovation Radar Prize. 20 of those will now move to the next phase and compete in Innovation Radar Prize final, having succeeded in securing the most votes. Come and meet them at the ICT Proposers Day event in Budapest where they will pitch their innovation to an expert jury! On 20 September 2017 the European Commission launched the Innovation Radar prize 2017. This initiative of the European Commission aims to celebrate high potential innovations – and the innovators behind them – that were developed in EU-funded research and innovation projects. 48 of the best innovators made the longlist for the prize and were competing in five categories. These SMEs, university teams, spinoffs and start-ups reflect the diversity of EU-funded research and innovation and come from every corner of Europe. The Innovation Radar Prize final takes place at the ICT Proposers Day event in Budapest on the morning of 9 November 2017. In Budapest the 20 finalists will get to pitch to a panel of investors and entrepreneurs their EU-supported innovation and their plans to get it 'out of the lab and into the market'. The jury will decide on a winner in each of the 5 categories. One of these winners will also be awarded the overall 2017 Innovation Radar Prize. This overall winner will then be featured on a Euronews programme about their innovation and its market potential. In addition to this a special 'public choice' award for the best pitch, as appreciated by those who attend the pitching session, will be presented in Budapest. The winners will be announced on this website on 9 November 2017.